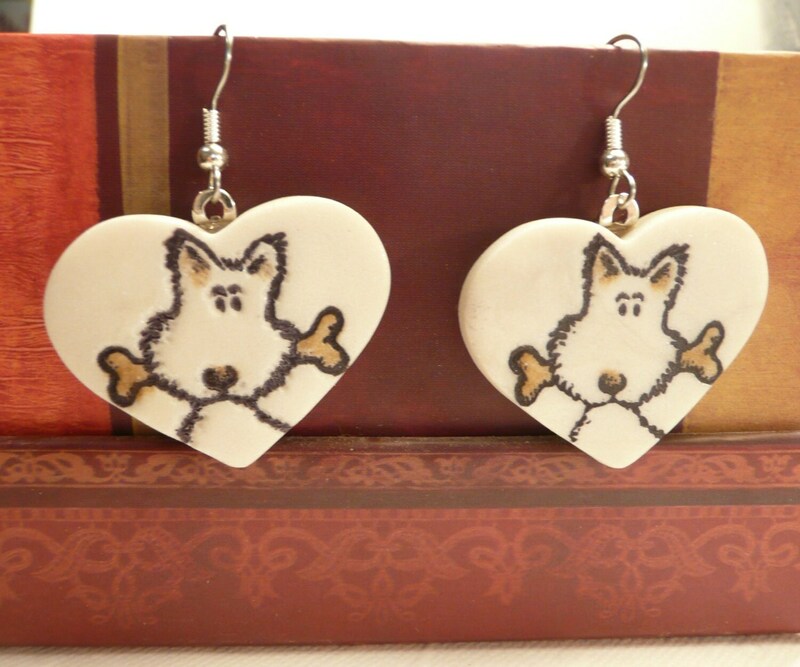 These cute dog earrings are sure to bring smiles! Choose heart shape or rectangle shape. Lightweight, handmade of light beige polymer clay, dog with a bone design stamped in black ink and accented with brown pastels. Heart earrings are approximately 1 1/4 inch wide. Rectangle earrings are approximately 1 1/8 inch wide. Both are approximately 1 3/4 inch tall including surgical steel ear wires. A customer who ordered a pair of dog earrings left this review: "These are just absolutely adorable!!!!!!" CUSTOM ORDERS welcome for other colors (any light color) and for matching pendant or pin ($10 each plus shipping). See last photo for samples.